Update - Unity Park has been renamed Chris Hadfield Park. 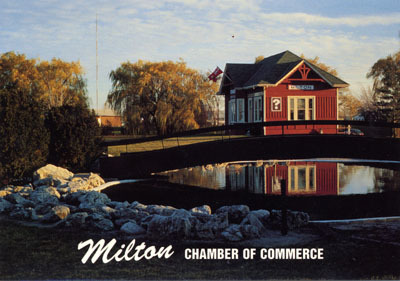 The building now serves as headquarters for the United Way of Milton and the Tourist Information Centre. Located at the intersection of Steels and Highway 25. Brad Clements, Halton Tours Ltd., Milton, Ont. 17 cm. x 12 cm.